Venezuelan opposition leader Juan Guaido is calling for nationwide demonstrations on Monday to coincide with his planned return to the country. Guaido on Sunday tweeted that Venezuelans should monitor his official announcements and that he would provide details about meeting points for supporters. He said they should gather across the country at 11 a.m.
Guaido was in Ecuador on Saturday as part of a tour of Latin American countries designed to increase pressure on Venezuelan President Nicolas Maduro to resign. 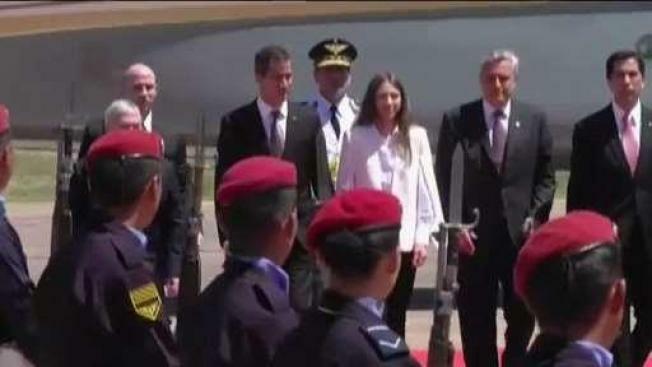 Guaido, who declared himself Venezuela's interim president and is recognized as so by the U.S. and 50 other nations, did not comment on the exact timing of his planned return to Venezuela. His spokesman, Edward Rodriguez, said "it's possible" that he will return on Monday. "We have little to celebrate and a lot to do," said Guaido, who recently visited the leaders of Brazil, Paraguay and Argentina in a campaign to build pressure on Venezuelan President Nicolas Maduro to resign. His return from the trip opens the possibility that Venezuelan authorities will try to arrest him. The opposition leader said he seeks a "peaceful transition" that will allow his homeland to overcome its political and humanitarian crisis. Last weekend, Guaido coordinated a failed effort to bring aid from Colombia and Brazil into Venezuela, where security forces loyal to Maduro blocked the supplies. Maduro described Guaido's gambit as part of a U.S.-backed plot to overthrow him. Moreno, who met Guaido in Ecuador's coastal city of Salinas, said he supported the opposition leader's attempt to bring "democratic change" to Venezuela.